My wonderful friend Jeniffer just had her first child two months ago. Baby Aaron came into this world on St. Patrick’s Day, and I must admit, I am a really big fan of him. At two months, he is still so tiny, but he is starting to make funny faces and noises, and he even smiles. Aaron makes me understand why people have babies; he is just so darn cute! For now though, while kids are not on my mind, I will continue to enjoy other people’s babies. Aaron has made activities with Jen more fun. She is the type of mom who is very adamant about not letting her kid confine her to the home so she takes Aaron almost everywhere with her if possible, except for the occasional very necessary girls night out. So when the lovely people at The Harding Tavern Invited me to come check out brunch, I was delighted, and invited Jen to meet me with baby Aaron. 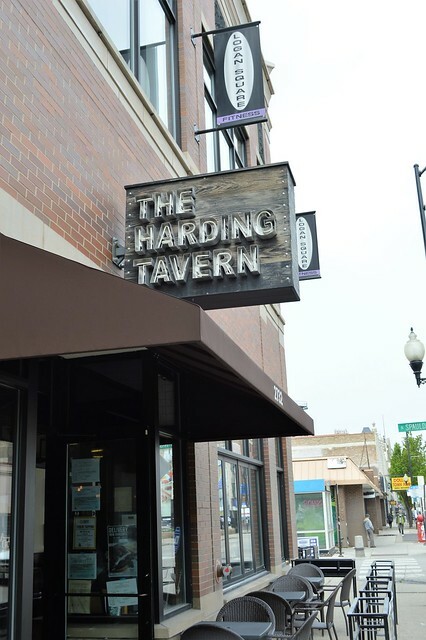 The Harding Tavern is Logan Square’s newest neighborhood tavern. Situated right on N. Milwaukee in the heart of Logan square, it is on a corner and has a large patio area out front. It’s named after the Harding Theater, which had occupied the same space from 1925-1963. It is definitely a spot that is a good representation of establishments that embody the spirit of the Logan Square area; industrial, casual, plays loud music— I loved it. I was worried that baby Aaron might not like the heavy metal playing in the background, but to my surprise, he didn’t really mind it. When Jen and I arrived around noon it wasn’t packed at all. The space is not that large, so it only takes a few people to make this place look full. It was nice to have the bar to ourselves for a moment. Our server was super attentive throughout the meal and that was nice. Soon after people started filtering in and out, just as you would expect from a tavern. I started off with a mimosa while Jen opted for plain orange juice. I was starving so as our wonderful server made our drinks, I quickly glanced at the menu. 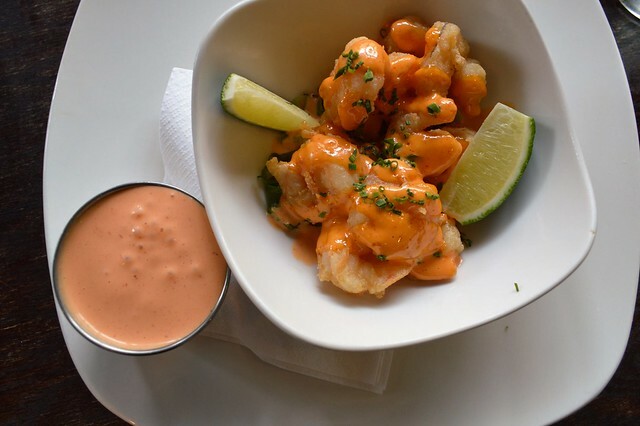 Before going to THT, as it is commonly called, I had looked at the menu, and the rock shrimp had caught my eye. I knew I wanted to start with that, so when our server came back with our drinks I promptly ordered that along with the apricot French toast. The shrimp appetizer and the toast came out soon thereafter and they looked awesome. The shrimp came with lime sriracha sauce, scallions, and a seaweed salad. The shrimp were deep fried to perfection, and that spicy sriracha sauce was everything I imagined it would be. After we quickly ate that all with just a few bites, we then moved on to the piping hot French toast. 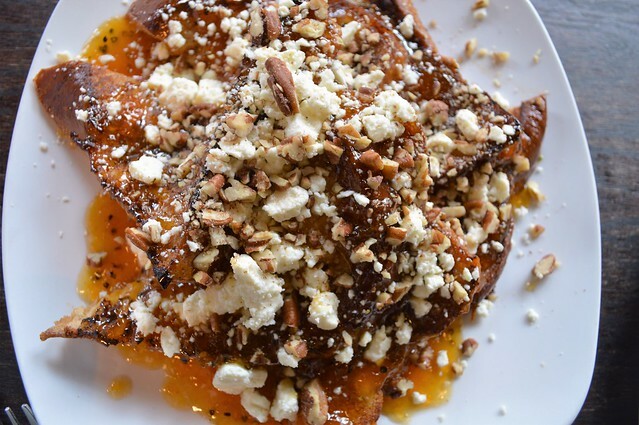 The first thing you notice about the toast itself is the massive amount of crumbled feta cheese on top—YUM. The toast was delicious, rich and slightly soggy from the milk and egg bath, it was soft on the inside but remained golden and crispy on the outer layers. It was really sweet, so anyone with a sweet tooth would love this. It is sweet in a way that is different from, say, strawberry pancakes. 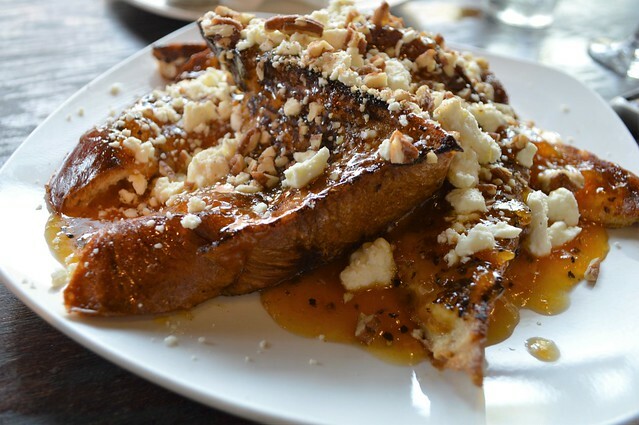 The feta helps balance and cut down on the sweetness to give the toast a creamy finish. For entrees, I went with the migas at the recommendation of our server. I love a good migas plate! 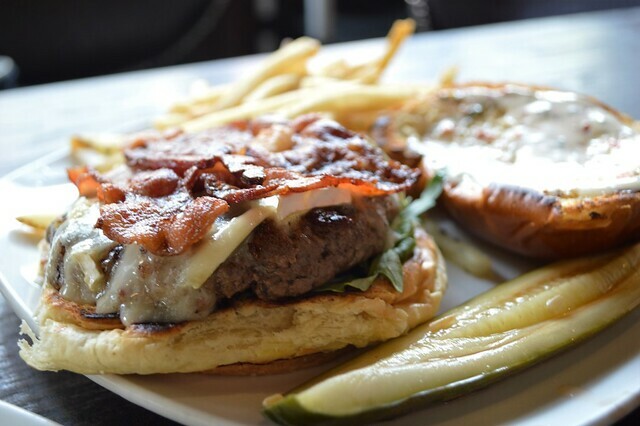 Jen opted for the THT burger, made with house ground roasted garlic beef, arugula, a spicy fresh herb aioli, brie cheese, Nueskie’s bacon, on a brioche bun. When my migas came out they were piping hot and the eggs where piled up perfectly on a bed of tortillas and an arbol salsa. Crumbled bacon, cotija cheese, and chives were scattered on top. It was bright and colorful, and looked delicious. It was really delicious. I must say that I had the sopes verdes at Lula Cafe last year, our “Best Overall Brunch” winner from our 2015 Best and Worst List, and I swore that the salsa verde with those eggs was the best salsa I have ever had, until now. 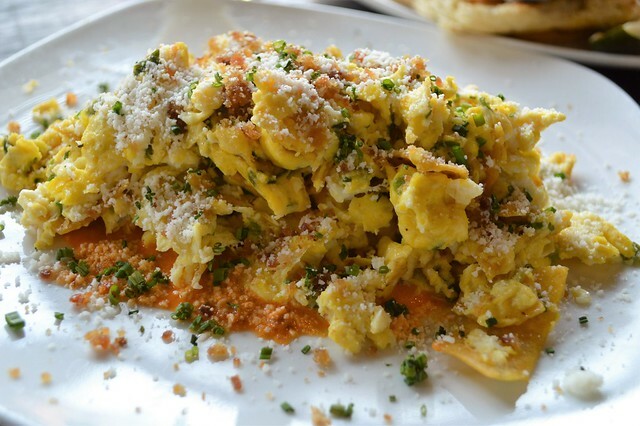 The arbol salsa that accompanies the migas at The Harding Tavern gives Lula Cafe a run for their money. It was really, really good. I literally would put it on everything. Jen loved her burger. She was excited about brie cheese on a burger, and she said it was a perfect component to compliment the other elements of the burger. Her fries were crispy and stringy; I can attest to their deliciousness because I was continually munching on them. She had to take a portion of it home as baby Aaron started to get fussy, and they were kind enough to wrap it up for her. 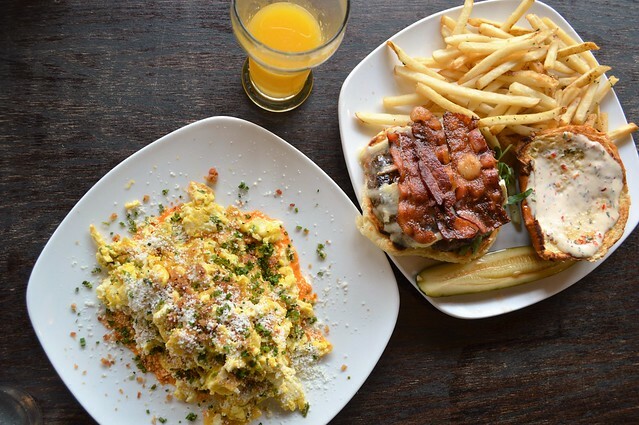 Brunch at The Harding Tavern is delicious. Everything was really yummy, flavorful, and presented beautifully. I must also note at how nice the staff were; at one point baby Aaron started crying and our server was kind enough to turn down the heavy metal a little bit. If you are in Logan Square for brunch sometime, this is definitely a spot to check out. Plus, they have a patio for summer! 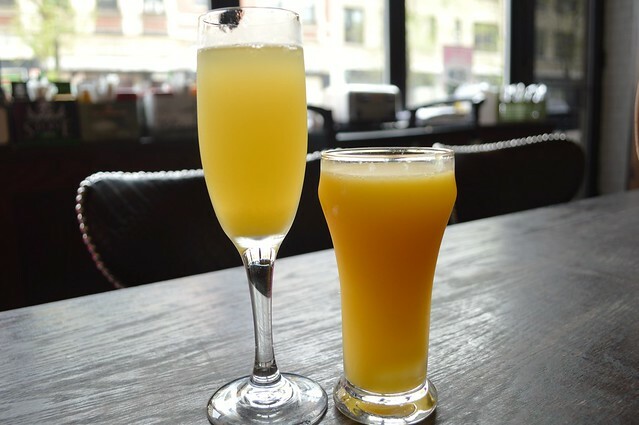 The Harding Tavern serves brunch every day from 11 a.m. until 4 p.m. Monday through Friday and on Saturday and Sunday from 10 a.m. until 4 p.m.